The season of crammed calendars, holiday parties and endless costume changes is officially upon us. With so much happening (for what feels like forever), it’s easy to toe line between busy and completely overwhelmed. To make your life a little bit easier, before life gets too crazy, invest in a few key pieces you’ll feel great about wearing from desk to school recital, company party, family dinner, and beyond! Our trick to pulling it off? It’s all in the details. A quick accessory swap – something as simple as trading your blazer and pumps for some sparkles and strappies – can transform your outfit in a way that 1) Looks ah-ma-zing, and 2) Couldn’t be any easier! We teamed up with our friend Tanya from Modern Mrs. to show you our Top 3 picks, perfect for your holiday season. Read along as we show you how to get through it all. Breathe in, breathe out, and bring on the dresses! Have a company party that begins immediately after your work day ends? It’s tight, but it’s not impossible – Don’t sacrifice style! Start with a dress you’ll feel great in all day and pair with simple pumps and a tailored blazer for a perfectly polished look. Before you leave for work in the morning, stash a cute clutch and statement earrings in your commuter bag. That way, come 5:15 when you’re still sitting at your desk eyeing the clock, you won’t have to worry about stopping home. Now that’s a power move. The Cocktail Party You're Actually Super Excited About! Maybe it’s the chill in the air, maybe it’s the holiday music on the radio, or maybe it’s the appeal of an invitation to blow off some steam during the busiest time of the year, but whatever it is…You. Are. Psyched…So go with it! You RSVP’d “Yes,” the sitter is scheduled, and now for the fun part. Use your excitement to put together an ensemble you’ll feel amazing about wearing! 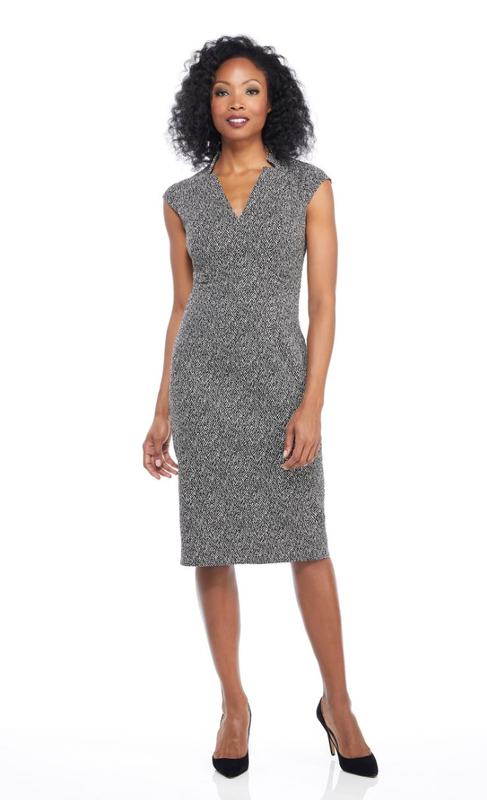 Start with a simple midi dress (Try one with a special little detail, like this scalloped neckline). Wear your go-to pumps into the office and pack a fun pair of party shoes for later. Our current favorite trick? The pièce de résistance: For your commute, wear a little faux fur under your everyday coat. That way you won’t feel any eyes when you get into the office, but you can easily slip it back on later. Enjoy! We can all agree that there’s nothing better than being surrounded by loved ones (and some really amazing food) – that is, if you’re there. There’s always going to be that one thing that slips your mind – Don’t beat yourself up! You’re only human and we’ve all been there – but don’t let your last-minute “OMG” be the reason you miss out. There’s always a way to move from desk to dinner without looking too stuffy. Ditch the blazer at your desk, throw on your favorite red lip (You know – that one shade you always keep in the bottom of your bag just in case), shake out your hair, and voilà! The evening’s best dressed dinner guest has arrived. How do you stay calm during a series of seemingly endless occasions? What’s YOUR special trick to keeping your desk-to-anywhere-else transformation totally stress-free? Let us know in the comments below! Want to see some more of our favorite looks for professional ladies on the go? Take a peek at The Workwear Shop.